This Chinese favourite is a simple dish to prepare at home. If you like, add a pinch of crushed red pepper or chilli-garlic sauce to give the sauce a little heat. 1. Prepare the baby spinach, red cabbage and mangetout and toss well and place covered in the fridge for 1 hour. 2. Remove the tofu from the pack, drain any water, slice into 2.5cm x 2.5cm pieces and keep chilled in the fridge for 1 hour. 3. Before serving, in a large mixing bowl, combine the garlic, ginger, honey, light soy, dark soy, rice vinegar, sesame oil, olive oil, black pepper and mix well. 4. To serve, drizzle 3-4 tablespoons of the dressing into the salad mix and toss to evenly coat. Place the dressed salad leaves onto a plate. Sprinkle over the chilled tofu pieces. 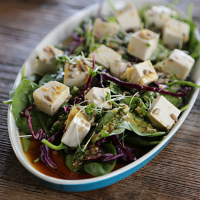 Dress the tofu and salad with remaining dressing. Sprinkle over the seed mix and mustard cress for garnish and serve immediately.